The user interface in modern versions of Excel—first introduced in Excel 2007—can be confusing, especially to those who have long used the interface of previous versions of the program. The new interface uses a “ribbon” type of interface, visible at the top of the screen. The ribbon is made up of different tabs, each of which contains a collection of related tools. The tabs that are visible often depend on what you are doing in Excel at the moment. One tab that is especially necessary for advanced users is the Developer tab. 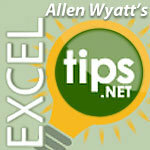 This tab contains a variety of tools that allow you to “develop” and customize Excel. Of particular importance is the fact that the Developer tab contains tools that allow you to create and access macros.